A few semi-hysterical folks in the media (especially those who detest the U.S. president) warn that Trump is starting a full-fledged trade war that will crater the global economy. If that doesn't do it -- say some of the usual Doom and Gloom promoters--China's retaliation by "dumping" dollars and Treasury paper surely will. As always, Yours truly cuts through the emotions, sales pitches and partisan "analysis" to look at the TRUTH of what's going on...and what is most likely to happen. CLICK BELOW: For my newest commentary entitled, "Our M.A.D. 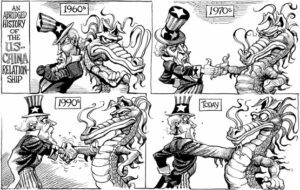 Policy with China...and what we DO have to worry about"